But Whitaker, who was chief of staff to Attorney General Jeff Sessions before President Donald Trump picked him Wednesday to replace Sessions, has worked as a conservative activist in recent years, raising questions about whether he can lead a department overseeing special counsel Robert Mueller’s probe into Russian interference in the 2016 election. Whitaker, a former U.S. attorney, is a well-known figure in conservative legal circles in Washington, D.C. Prior to joining the Justice Department as Sessions’ chief of staff, Whitaker founded a conservative judicial watchdog group, the Foundation for Accountability & Civic Trust, that called for investigations into Hillary Clinton, former Rep. Patrick Murphy, D-Florida, and into accusations that the Democratic National Committee was working with the government of Ukraine to dig up dirt on Donald Trump during the 2016 presidential election. During the 2016 election, Whitaker, who ran as a Republican for the U.S. Senate in Iowa in 2014, called for a special counsel to be named to investigate Clinton’s use of a private email server as secretary of state. He has also repeatedly criticized Mueller’s Russia investigation, which the Justice Department oversees, both in appearances as a CNN commentator and on Twitter. Those attacks on the Mueller probe, in particular, are drawing fresh scrutiny now as Washington waits to see how Whitaker will approach the investigation in his new role. In an op-ed published last year by CNN, Whitaker warned Mueller would be crossing a “red line” if his investigation looked into the finances of the Trump family. “If he were to continue to investigate the financial relationships without a broadened scope in his appointment, then this would raise serious concerns that the special counsel’s investigation was a mere witch hunt,” Whitaker wrote. Whitaker warned Mueller would be crossing a ‘red line’ if his investigation looked into the Trump family’s finances. The New York Times reported in September that the Trump administration was prepared to name Whitaker as the No. 2 at the Justice Department should Deputy Attorney General Rod Rosenstein resign. Rosenstein kept his job after a flurry of speculation that he would be fired following a New York Times report that suggested Rosenstein had raised concerns about Trump. Rosenstein had been overseeing the Russia investigation after Sessions recused himself. But a Justice Department spokesperson said Wednesday that Whitaker is now “in charge of all matters under the purview of the Department of Justice,” which presumably would include the Russia probe. Progressive activists denounced Whitaker as a political operative. Whitaker has long been involved in Republican Party politics. 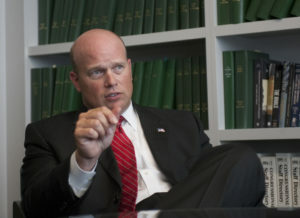 Whitaker received a law degree from the University of Iowa and then worked in private practice before being appointed in 2004 by then-President George W. Bush to serve as U.S. attorney for the Southern district of Iowa. Whitaker held the position until 2009. As U.S. attorney, he prosecuted national security, immigration, income tax and firearm cases. Few of those cases were high profile. In 2008, he was part of a nationwide effort by the Justice Department to crackdown on fraud in the H1-B visa program for high-skilled immigrant workers. Whitaker, who has said he believes marriage should be between one man and one woman, grabbed headlines when in 2007 when he prosecuted an openly gay Democratic state senator in Iowa for alleged extortion. The senator was found not guilty, and Whitaker was criticized for running a politically motivated case. After leaving the office of U.S. attorney in 2009, Whitaker, along with Chris Hagenow and Bill Gustoff, founded the law firm Whitaker Hagenow & Gustoff LLP. The firm’s name was changed to Hagenow & Gustoff when Whitaker left in September of last year to become Sessions’ chief of staff at the Justice Department. People who know Whitaker say he deserves an opportunity to prove himself. Whitaker’s private legal career largely focused on white collar litigation. People who have known Whitaker for decades said he deserves an opportunity to prove himself. Gustoff said he, Whitaker and Hagenow founded their law firm with common conservative beliefs and the goal of serving their faith, families and Iowans rather than solely to make money. “Our politics plays into our law and our law plays into our politics,” Gustoff said in an interview. Others praised Whitaker’s integrity and argued he wouldn’t let his personal beliefs cloud his judgment. “Regardless of what his positions are, he has a job to do, and he will do that within the frame of the law,” said Scott Raecker, the executive director of Drake University’s center focusing on leadership ethics and civility and a former Iowa state representative. Still, Whitaker has made his strong conservative viewpoint and support for the Republican Party clear. Whitaker was the co-chair of Raecker’s 2010 re-election campaign for the state legislature, and co-chaired former Texas Gov. Rick Perry’s 2012 presidential campaign in Iowa. He ran for Iowa state treasurer in 2002, years before making his failed 2014 U.S. Senate.